There are so many different accessories available for your bicycle—yet bike speakers are among the most unique. When it comes to finding the right bike speakers, you want to find speakers that are able to project loud enough to hear outdoors, yet that are durable enough to withstand use outdoors. Based on this criteria, along with a look at pricing, warranty and additional features, we found that the Venstar Sport was the best overall bike speaker. In addition to our pick for top bike speaker, we also found other great speaker options that may work for your bike, depending on your individual needs. A great bike speaker can be a wonderful addition to your trusted bicycle. These speakers can not only make sure that you have plenty of entertainment while you ride, but they can also come with a number of other features such as radio access and even headlights that can further improve the performance of your bike. We spent hours looking at different bike speakers and learning what features avid bike riders look for the most. When comparing different bike speakers, we looked at size, features and battery life to find the best products available right now. 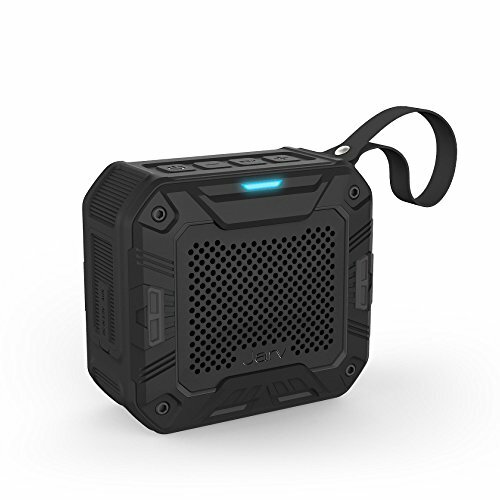 When it comes to heavy-duty bike speakers, very few products can compare to the Venstar Sport Bluetooth Speaker. This compact, yet durable speaker comes in a rubberized plastic casing, meaning it is able to withstand even the most exciting of adventures. What we love about this speaker is that it not only has a built-in FM radio, and Bluetooth capabilities, but it is a speaker first and foremost, meaning the sound quality is top-notch with this device. It comes with BAS audio technology for stable HD audio, no matter how bumpy the ride. It is waterproof, shockproof and dustproof. You will be shocked at the sound quality that comes from such a compact little device and just how long it will last use after use. Plus, with every charge you can enjoy up to 8 hours of battery life, making it the perfect companion for all of your adventures. The Jarv Big Shot Bluetooth Speaker is a great option if you want to also have a FM radio with your bike speaker. 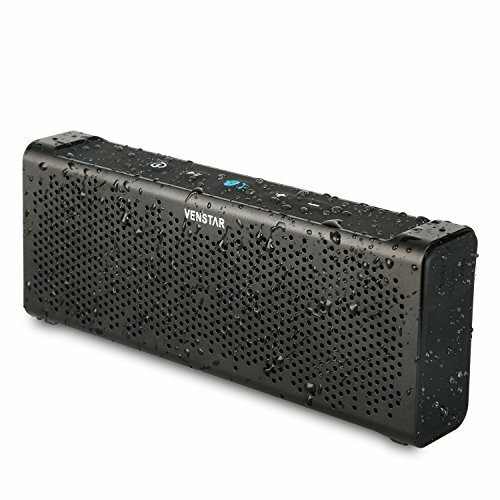 The durable, shock absorbing outer casing of this water-resistant speaker means it can handle any adventure you throw at it. Plus, it can easily detach from your bike and go with you, thanks to the included Carabiner clip, which makes it a favorite for camping, hiking, beach-going and more. The included Bluetooth capabilities on this compact radio are powerful as well, as you can enjoy up to 12 hours of playtime and streaming capabilities of up to 33 feet away from your compatible Bluetooth device. If you want to listen to the included FM radio—enjoy even better battery life. The radio feature can be listened to for up to 30 hours with a single charge, which is why this makes our list as the top FM bike radio and speaker out there right now. Despite its small price tag, this little speaker comes up big in terms of features. This USB rechargeable bike speaker has a light and Bluetooth capabilities. In addition to the extra headlight feature, we love that it is also waterproof, meaning this speaker will last no matter where your adventures may take you. The rechargeable battery can be charged for 8 hours of performance time and comes with its own 4800mAh portable charger. Once this speaker is fully-charged and ready for use, you can play your music or answer phone calls with the Bluetooth capability and enjoy the ease of hands-free and wire-free use when you are on the road. Bike Speakers are such versatile accessories for the avid bike rider and even the occasional user. These bike radios can go with you on a number of adventures and can come with a variety of features that make them even more versatile. While we looked into all of the unique things that these bike speakers can offer, we created a detailed list of speakers that are sure to satisfy the needs of every type of user. If you are looking for a new bike speaker for your bicycle, one of the first things that you need to do is to think about how you will be using this bike speaker. If you are a casual rider, you may have different considerations than those who mountain bike and need more durable shock absorbers in their speakers. There are also many different bike speakers that can be removable, making them ideal for camping and hiking. As the technology involved with these speakers continues to become more and more advanced, so do all of the features that come with these speakers. If you are contemplating which type or style of speaker is going to be best for your needs, we have created a detail buying guide that can help you through the process and help make sure that you end up with the right bike speaker. As you browse the different bike speakers available today, there are a few key considerations to take a look at in order to find the best speaker for the money. Audio quality is important, as you want to be able to hear your music, programs or phone calls while you ride outdoors. However, this is only the beginning of the key considerations to look at when shopping for bike speakers. Some of the older bike speaker models didn’t come outfitted with Bluetooth technology. You would need to plug your device into the speaker and also find a suitable mount for your audio device or telephone. These types of speakers are still available but are becoming far less common. Make sure that your speaker is Bluetooth capable so that you can wirelessly hook your phone or media player to the speaker. Pay close attention to how far the Bluetooth distance is for that particular speaker. While it won’t matter as much while you are on your bike, if you are planning on using this speaker outside of your cycling, you may want a longer Bluetooth distance capability. This is extremely important when it comes to finding Bluetooth speakers for your bicycle. Biking on rough terrain can take a toll on delicate speakers, and even an unsuspecting crack in the sidewalk can cause enough of a bump to do some damage. This is why it is important to look for speakers that are shock resistant especially if you are planning on taking your speaker on trail rides. This isn’t the only consideration when it comes to durability. Finding speakers that are dust proof is also important as you will be using your speaker outside and dirt, dust and other particles are going to get inside your device. Finally, make sure that you find a bike speaker that is waterproof. 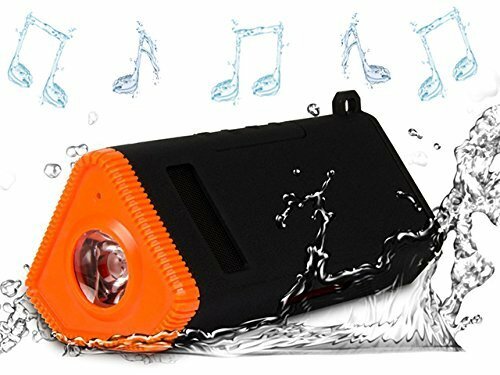 This doesn’t meant that you need to go swimming with your portable speaker. It just means that your speaker needs to be able to withstand an accidental splash from a puddle or some light rain. It will ensure that your bike speaker is up and ready to handle any adventure that you throw at it. This is an obvious and important thing to look for in any bike speaker. After all, you want your speaker to be able to last as long as all of your rides. The average Bluetooth bike speaker should be able to last for at least 8 hours with a single charge. Most bike speakers are rechargeable, instead of using disposable batteries. If you have a 4000 mAh battery, it can last up to 15 hours with a single charge. IF you have a 6000 mAh battery, it can last up to 30 hours per charge. However, it also depends on what other features you are using with your speaker. If you are also using it for phone calls and utilizing the headlight—you aren’t going to get as much battery life. As you really start comparing different bike speakers, you will notice a few key features that can separate different bike speakers from one another. Here are some of the key considerations to look out for as you start to compare bike speakers. Although these features may be small, they can make all of the difference in the usability of your bike speakers. Your bike speaker needs to mount on your bicycle in some form of fashion. Depending on the speaker, the mount will either be for the handlebars or for the frame. However, most users prefer a handlebar mount, because it makes the speakers easier to hear. The speaker should be mounted snugly to the bike so it is not damaged or dislodged while you are riding. There are some bike speakers that are only mounted with a carabiner. The carabiner can be a benefit if you are looking to take your bike speaker with you while camping or hiking. However, if it is the only way that the speaker attaches to your bicycle, it may not be the most durable for rugged rides. If the bike speaker is mounted with Velcro, make sure that there are plenty of straps to ensure a secure fit. The bike speaker you choose should be able to securely attach to your bicycle. However, depending on your intended use, you may also want this bike speaker to be easily removable and portable as well. There are many bikers who will want to remove their bike speaker and take it with them on their adventures. Most standard bike speakers are just that—normal bike speakers. However, as these speakers become more advanced, they also can come with more additional features. The most common is to also include a FM radio. This is a great option for those who want to listen to a variety of programs during their ride. Also, when you use the speaker in FM radio mode, you are often able to get more battery life out of your device. Other bike speakers come with compasses, or headlights to bring even more usability to these devices. The right Bike Speaker can be a valuable addition to your bike. Whether you prefer to take leisurely rides about town, or if you are planning on mountain biking and hiking through the wilderness—a bike speaker is a great way to bring a little fun to your next journey. Listen to music, answer phone calls or enjoy some audio books all with this single device. Just make sure that you look at some of our key considerations and browse our top picks for today’s best bike speakers as you shop for the right product to meet your needs. This can lead you in the right direction as you shop for this versatile bike accessory.